Ramgarh Light Infantry marching close to Chaibasa, 1841. By Samuel Richard Tickell. © The Zoological Society London. This is the lower half of one of the first paintings of the Ho country. Samuel Richard Tickell painted it in 1871 from much older sketches. Its main subject was the bird, of which we here see just some feathers, the Graucalus Macei—the greater Cuckoo-Shrike. It was spotted by Tickell in 1841 in Chaibasa, Singhbhum. 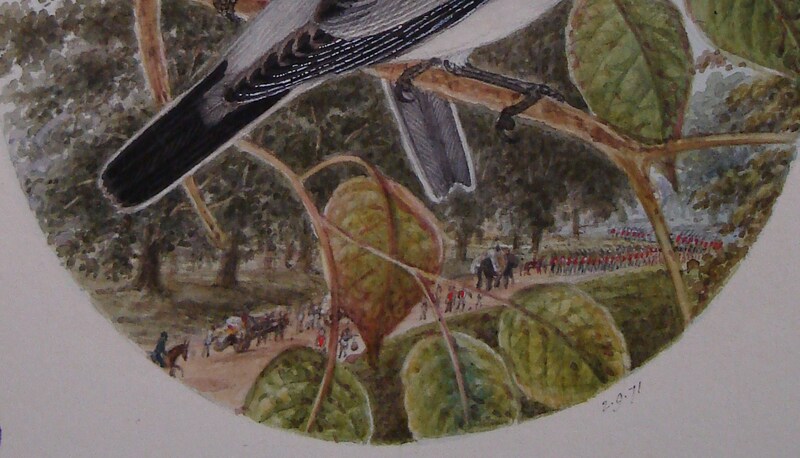 Tickell loved to put his birds in real landscapes, which this part highlights. Note the ‘English park’ landscape near Chaibasa, which he liked very much, and the army marching. Tickell was not at ease with fighting, though, and cherished his stay with the Hos. The painting is plate 5 in my book A Land of Their Own. It is taken from Samuel Richard Tickell, ‘The Zoological Works of Samuel Richard Tickell’, illustrated manuscript work in 14 volumes, vol. vii, plate 2, London: Zoological Society of London, [1865-1873]. By permission from the Zoological Society London.